This section contains the most common problems, questions, known issues and situations which happen in Graphical Installer. You can find here answers to many of your problems. If your problem is not mentioned here do not hesitate and contact us! NSIS stands for Nullsoft Scriptable Install System. NSIS is a tool that allows programmers to create installers for Windows. It is released under an open source license and is completely free for any use. NSIS creates installers that are capable of installing, uninstalling, setting system settings, extracting files, etc. Even with all these features, NSIS is still the smallest installer system available. With the default options, it has an overhead of only 34 KB! More details can be found on http://nsis.sourceforge.net/. Inno Setup is a free installer for Windows programs. First introduced in 1997, Inno Setup today rivals and even surpasses many commercial installers in feature set and stability. It may be used completely free of charge, even when deploying commercial applications. More details can be found on http://www.jrsoftware.org/isinfo.php. What is the difference between NSIS and Inno Setup? Which one should I choose? Simply to say NSIS is more powerful than Inno Setup. If you are creating simple installer then it does not matter you choose NSIS or Inno Setup. But if you want your installer to have some advanced features it is better to choose NSIS as its scripting system is really powerful. There is also plenty of third-party plug-ins for NSIS available which can save your time and works. If you know Delphi (programming language Pascal) than rather choose inno Setup because its syntax is very similar to this language. Graphical Installer is an extension for NSIS and Inno Setup (or better say bunch of tools) for creating professional good-looking installers with custom design. It is NOT a new install system - it is only an enhancement to existing install systems for very simple way of creating custom design installers. Check Features to learn more about it or download working examples to see it in action. What is the difference between Graphical Installer for NSIS and Graphical Installer for Inno Setup? Both versions use the same principles: they allows you to create custom design installer: show picture in main window, skin buttons, set custom colors for texts, headers, progress bars, icons, ... Most of your graphic resources will fit to both versions. There are small changes: Inno Setup supports more picture formats, but NSIS can create small exe file and supports skinning of Checkboxes and Scrollbars. Also NSIS supports skinning of Uninstaller which cannot be achieved in Inno Setup. Do both systems (GI for NSIS and GI for Inno Setup) support the same features? Not all features may have the same behavior for NSIS and Inno Setup. There are small differences in these install systems which GI respects. If you want to be sure your future installer has certain specific feature please contact us. Approximately 98% of the features are the same in both systems, but Inno Setup offers a little more enhanced API. If you are not sure which version to choose contact us or choose GI for Inno Setup. Your product looks really great! How much will it cost to me? Basic price for the product is low, so everyone can afford it. We have two business models: for Personal use and for Commercial use. For Personal use it costs € 17.95. For Commercial use we offer Graphical Installers in several license packs, price starts at € 49. The more licenses you buy the bigger discount you get, see the Purchase page for list with actual prices. How many installers can I create with Single license? Basic rule is: Single license is tied with single product. There are no other person/date/machine/number specifications! Example: You wish to sell a product called "My Product". You buy "Single license" for 1 installer and you create your installer. It is OK. You sold 100 000 units of this product - it is fine because license is not tied to this number. Now you want to create a demo version of "My Product" - again it is fine to use the same license. Later (see next question) you decide to create an update for this product (like v1.1, etc. ), or even "My Product v2.0" - it is still fine and it does not matter how many people will download this update, because license is not tied to that number. But when you want to create installer for "My Other Product" - you need to purchase new license for it. Is there any date or time restriction related to purchased license? No. Once you have bought Graphical Installer, you can release patches for the same product (see previous question) forever. Graphical Installer is shipped with full source codes, so if you decide to create installer many years after purchase it will still work perfectly. License policy is fair and simple: Single payment with no other hidden fees or catches. The prices shown above are final - there are no monthly fees and no royalties. How can I try your product? Is there any Demo or Trial version available? Yes! Simply click the Purchase page and downloaded a FREE Trial version. Trial is full featured product with no limitations and works for 30 days (After 30 days installers build with Trial version stop working). You can use this version for 30 days (with full email support!) and after it [if you decide not to use Graphical Installer any more] you need to purchase a License (Personal/Commercial) if you want to continue using the software or you need to uninstall it and delete all installers made with Trial version! Can I get your software on a CD? We are sorry, but Graphical Installer is a download-only product. You are welcome to burn our install image to CD for backup purposes but we do not send software on CD. I downloaded Trial version and I am satisfied with it and want to use it for commercial purposes. What shall I do? Simply contact us and we will switch your Trial version into full commercial version (by purchasing appropriate number of Licenses). You do not need to uninstall it. Do not forget to mention how many licenses you wish to use. I finished my project, I used Graphical Installer for creating custom design installer, what now? If you are sure you will never-ever use Graphical Installer - then uninstall it. If there is possibility you will use it for your next installer then you may keep it on your hard drive [But you cannot use it for creating another installer!]. Do not forget to buy new license in the future! How can I make such cool installer like [select-one-you-like] in your gallery ? Do I need to hard-code it? No. We have developed several tools for that purpose. For creating new installers use our a plug-in called Graphical Installer Wizard which is available as plug-in for several IDEs. That will enable you to create install scripts by a few clicks. Whole installer can be simply configured, you can choose files, texts, pictures even colors of texts! I have existing installer and want to design it. How to do it? Simply use our Graphical Installer Wizard and convert your old installer into cool one. It is plug-in for several IDEs (HM NIS Edit, Inno Script Studio, Standalone application, Eclipse IDE, Embarcadero RAD Studio 2009, 2010, XE - XE8, 10 Seattle, 10.1 Berlin and Microsoft Visual Studio 2005 - 2017). With it you can convert your existing installer. All you need is to have sources (script files) for your installer. What programming language do I need to know to create such cool installer? No language is needed. With our Wizard you are able to create whole installer without writing one line of script! However if you want to create more sophisticated solutions you will have to learn syntax of NSIS or Inno Setup. Because it is based on script files, you can fully control every part of your installers. The script language supports variables, functions, string manipulation, just like a normal programming language - but designed for the creation of installers. Can I switch the installer design back to normal (standard Windows look)? Yes. It is easy to switch between 'skinned' and 'classic' design of installer Modify only single line of script to completely change the design of your installer - comment symbol GRAPHICAL_INSTALLER_PROJECT_UID. Why do I have to pay for your product, to be sure NSIS/Inno Setup is free (even open source)! Our product is based on an idea similar to web CMS systems: basic system is for free but advanced extensions are paid (or like Free to play model in MMO games). That means that the standard install system is free (even open-source). You can download it and make installer for your software for free with basic knowledge. But when you want to easily create more sophisticated solutions e.g. custom design installer with our tool - you need to pay small amount. Why? Because if you want to do it by yourself, you need to learn install system script syntax - and this takes some time. In a fact it is not very hard to create installer from scratch - all you need is to be *really* experienced user - and to have several hundreds of hours of free time to develop such an installer. But with our tool you can create such an installer in less than 10 minutes! So you save a LOT of your time! That is because we spent thousands of hours developing our tool instead of you and we provide it to you for this small fee. Can I do [put-desired-some-feature-name-here] in Graphical Installer? Definitely Yes! There are a lot of features that are supported in NSIS and Inno Setup (and that means they are also supported in Graphical Installer). If you are a C/C++/C#/Delphi/VB programmer you can also make your own custom plug-ins! If you have no experiences you can always ask on official forums! There is a lot of information available. I have an existing installer in NSIS/Inno Setup. Can I change it to Graphical Installer powered? Yes. There are no differences between syntax of scripts and Graphical Installer scripts. If you obtain some errors during the converting your script, do not hesitate and contact us. I have an existing installer in [put-your-install-system-name-here]. How can I create such cool custom design installers? You need to switch to NSIS or Inno Setup. Every installer can be rewritten using NSIS scripting system or additional plug-ins. In case you have no NSIS skills you can use our Services and we will rewrite your installer instead of you! Can I pay for your product/services by my credit/debit card? Yes of course! It is possible to pay by your debit or credit card as a PayPal Guest. Check logos on PayPal website to see whether they match your card. Why need I go to www.unsigned.sk to purchase your product? We are sorry for this inconvenience but there are technical reasons. All our products (not only Graphical Installer) must be purchased via that page. Payment is secured, you do not need to worry about your money. Our PayPal account is of course verified by PayPal itself! Is the payment secure? I heard lot about risk from on-line payments! Yes. All payments are processed by secure PayPal servers. You can check it in your preferred web browser. I made a payment but I did not receive download link. You defrauded me!? All payments are processed by external system - PayPal. 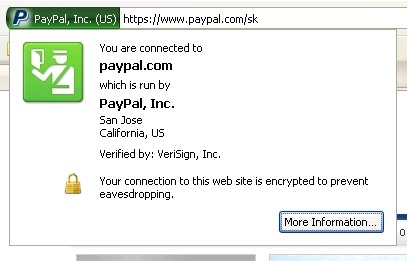 Immediately after receiving payment notification from PayPal servers, our automated system will send you a download link. This link is sent to email address tied with your PayPal account. Please check corresponding account and also your spam folder. If no email arrives from unSigned site within 20 minutes since payment, do not hesitate and contact us. 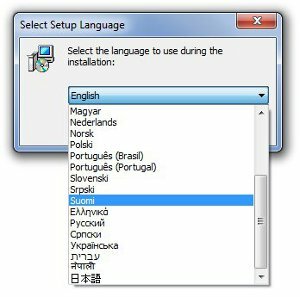 Will my installer support RTL languages like Chinese or Russian (with special characters)? Yes. There is more than 40 translations are already included, but you can also create your own language files. RTL (Right-To-Left) languages such as Arabic and Hebrew are fully supported. 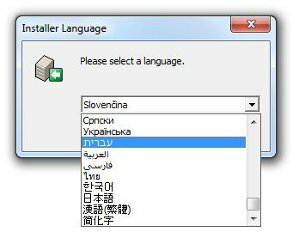 For proper displaying of some RTL languages (like Chinese, Russian or Hebrew) you need the Unicode installation system. See Unicode question for more info. Are there any projects/companies that already use Graphical Installer? Yes. Our product has been used in more than 50 000 solutions, check out our Gallery. To see some customers simply scroll down. 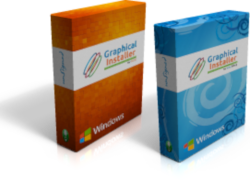 If you wish to try out Graphical Installer then do not hesitate and immediately visit the Downloads page. Can I add custom pages/macros/functions to the script? Yes. Again: there are no differences between syntax of regular scripts and Graphical Installer scripts. Everything you used to do in your scripts you can do in Graphical Installer. Will the generated installer run on Windows 95/98/200/NT/XP/2003/Vista/7/8/10 or on Mac/Linux/Android/iOS? Only Windows are supported. All NSIS and Inno Setup installers are naturally designed for Windows, but they can successfully run on Linux (via Emulator). We have no evidence that someone had successfully run these installers on a Mac, Android or iOS. I am NSIS/Inno Setup newbie, I am totally lost in that *scripts*. I need help with them - what should I do? You can delegate us to create you the whole installer, from the scratch. Use our Services page to learn more. If you want to learn NSIS by yourself you can ask on NSIS official forums. There is a plenty of information. What is the difference between version 1.01 and v2.01 (v3.01 and so on)? Graphical Installer started as an open-source project on NSIS forums a few years ago. It had expanded quickly and because it was very popular it transformed into professional (commercial) product. The very first public (commercial) version we released was v1.01. In the next year we developed completely new version (internally called v2.01) which has a lot of new features, fixes and improvements. In 2011 we added support for Inno Setup (version 3.01) so creating custom design installers is also possible for Inno Setup installers. Latest version is available on this site, older version can be found in Archive. You can view details about versions in Changelog and Readme files in Graphical Installer package. Can I create the Unicode version of my installer? Yes - You need to download the Unicode build of NSIS/Inno Setup (NSIS 3.0 or newer, Inno Setup UNICODE version is available directly on Inno Setup website). Then reinstall Graphical Installer (into directory where you installed Unicode install system). Now you can successfully create Graphical Installers in Unicode. If you have some troubles check FAQ on Unicode NSIS page or Inno Setup forums.